Eucharistic adoration is a practice in the Roman Catholic, Anglo-Catholic and some Lutheran traditions, in which the Blessed Sacrament is exposed and adored by the faithful. 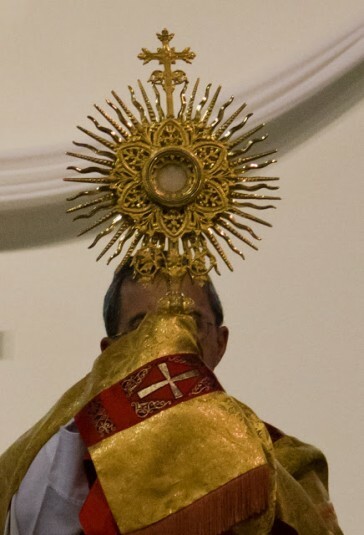 Adoration is a sign of devotion to and worship of Jesus Christ, who is believed by Catholics to be present Body, Blood, Soul, and Divinity, under the appearance of the consecrated host, in the form of hosts, that is, consecrated altar bread. As a devotion, Eucharistic adoration, prayer, and meditation are more than merely looking at the Blessed Host, but are believed to be a continuation of what was celebrated in the Eucharist. From a theological perspective, the adoration is a form of latria, based on the tenet of the Real Presence of Christ in the Blessed Host. Christian meditation performed in the presence of the Eucharist outside of Mass is called Eucharistic meditation. When the exposure and adoration of the Eucharist is constant (twenty-four hours a day), it is called Perpetual adoration. On the first Saturday of the month, Adoration of Holy Sacrament and the Sacrament of Reconciliation is 7:30PM at St. Clare Church.